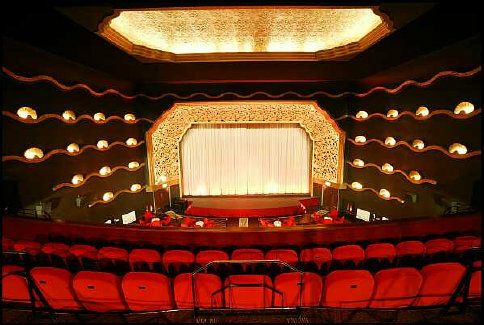 While on a trip to England in 2006, in the town of Berkhamsted, I visited a magnificiently restored Art Deco Theatre.... The Rex Cinema (pictured below). Behind the bar in this theatre were 2 Art Deco stained glass lamps unlike anything I had ever seen before. The photo's on the right are these lamps. 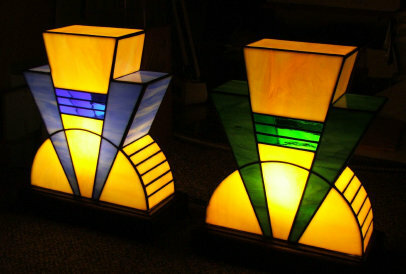 I took pictures and made a mental note to reproduce one of these lamps....for fun....when time permitted. Usually I lose these mental notes, but in this case, I remembered, and built three copies of Helen's lamps almost two years later. My lamps are pictured below. They each contain 43 pieces of glass. 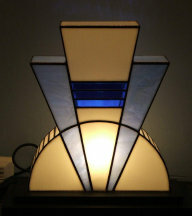 The glass part of the lamps measures 11 1/2 " high, 10 1/2" wide and 3 3/4" deep. The glass sits on a solid red mahogany base measuring 11 1/4" wide, 5 1/4" deep and 1 3/4 " high. 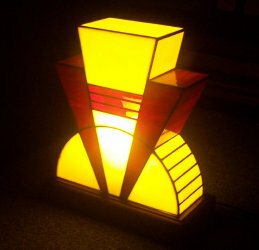 These lamps are not for sale.... but are illustrated here to show some of the interesting possibilities of stained glass construction. 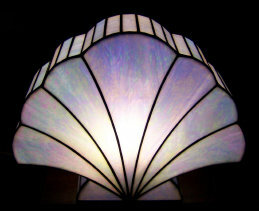 The above stained glass lamps were designed and built by Helen Watson, internationally known stained glass artist from New Zealand. 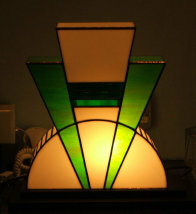 Although classic Art Deco style, these are Helen's original designs built for the Rex Cinema.